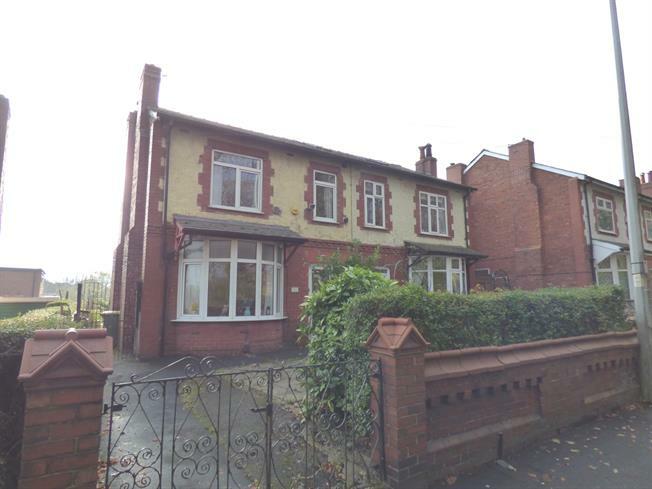 3 Bedroom Semi Detached House For Sale in Preston for Asking Price £130,000. Fantastic extended three bedroom semi detached family home boasting two reception rooms and good sized rear garden. Situated within Ribbleton offering easy access to motorway links, local amenities and schools. The accommodation briefly comprises; vestibule, hallway, lounge, dining room, breakfast kitchen, sun room and downstairs wc, to the first floor, three bedrooms and four-piece bathroom. Double glazing and gas central heating system, gardens to the front and rear, driveway. Viewing highly recommended..
Staircase leads from the hallway to the first floor landing, radiator and laminate flooring. Double glazed bay window to the front, wood mantle with electric fire, radiator and laminate flooring. Double glazed window to the rear and side, wood mantle with gas fire and radiator. Double glazed window to the side, range of wall and base units with complementary work surfaces and breakfast bar, stainless steel sink and drainer, gas cooker point, space for dishwasher and part tiled walls. Single glazed window and wood panelled door to the side, space for washer and dryer. Single glazed window to the rear and side, stainless steel sink and drainer. Four piece bathroom comprising shower cubicle, bath, wash basin, low flush wc, part tiled walls, radiator and double glazed window to the rear. Hedge enclosed gardens to the front with driveway. To the rear is an extensive private rear garden with paved patio and lawn, mature shrub borders, shed and gated access to the side.